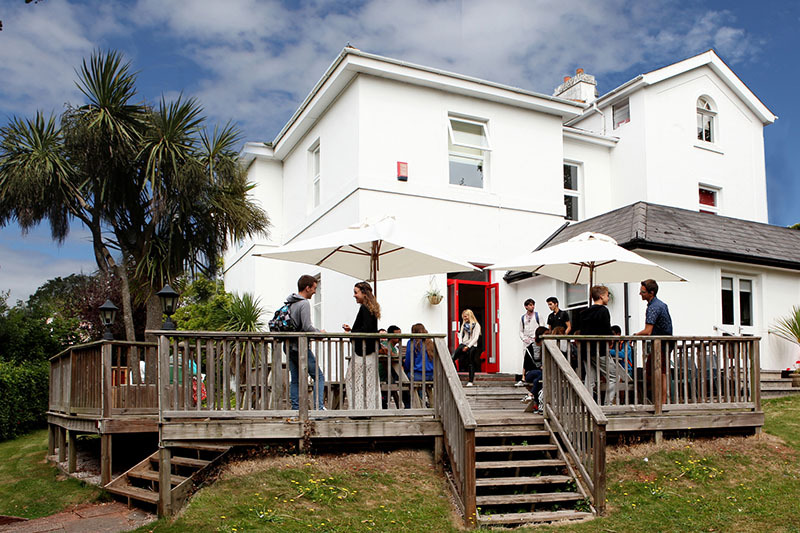 The Torquay International School (TIS) is located just a few minutes on foot from Torquay town centre and is surrounded by large gardens and a volley ball court. The school was founded in 1972.
table tennis tournament and many others. Excursions are also available for example to Exeter, Port of Topsham, Dartmoor National Park, etc. The intensive course consists of 15, 19, 23 or 30 lessons tuition per week and the aim is to help you achieve fluency, accuracy and confidence in both spoken and written English. There are classes at all levels from Elementary to Advanced. Please contact us if you have special dietary needs so we can inform the school in advance, a surcharge of € 43 will be applied for this. Arrival London Heathrow (private taxi): € 327 (one-way). Arrival transfer (private taxi) Bristol Airport: € 188 (one-way). Arrival transfer (private taxi) Gatwick Airport: € 375 (one-way). Arrival transfer (private taxi) Gatwick Airport? In 2019 the school organizes lessons as usual on all public holidays including Easter and will be closed only 23/12/2019 - 05/01/2020. English for the Over 30´s. This course is designed for more mature students and professionals wanting to improve the English language in a more intensive setting with a maximum of 4 students per class. It consists of 15 lessons in the morning which focus on general English whether for travel and holidays, work, or just for personal satisfaction. You need to have at least a pre-intermediate level of English (A2). You can add optional lunches with the teacher; you can join the teacher at lunchtime and continue improving your conversation skills (cost of lunch not included). The Club 50 course has a duration of 2 weeks and combines an intensive course of 15 lessons per week with cultural activities to discover the beautiful Devon region in the South of England. The program is inspired by English literature, especially because famous writers such as Agatha Christie and Sir Arthur Conan Doyle lived in this destination. You will see Torquay through the eyes of his books. English classes are from 09:00 to 12:00, from Monday to Friday. In the afternoons, activities are such as: visit to the Agatha Christie summer house, visit to a vineyard, movie afternoon, visit to the Torquay museum. On Saturday (after the first week of the course) a full day excursion is organized, for example to South Hams & Burgh Island. English for the Over 30´s. This course combines the Minigroup 30+ course, which consists of 15 lessons in the morning in a small group with a maximum of 4 students per group with 15 private lessons in the afternoon. You need to have at least a pre-intermediate level of English (A2). You can shape this Cambridge exam course to your preference. You can either take 15 lessons per week of specific Cambridge exam preparation, or a combination of these 15 Cambridge preparation lessons with 15 General English lessons per week. Please note that the options differ according to the number of lessons, the season and the level you want to take the exam at (FCE, CAE or CPE). Please make sure to check and reserve your preferred exam date in advance. The Cambridge courses might need an extra night or week of accommodation due the exam date and according level. Extra accommodation is not included. Price upon request. Prices of this course do NOT include the exam fees (to be paid on spot, approx € 200). This is an intensive, 5 week summer course with 15 lessons per week aimed at those trying to pass the First (FCE) and Advanced (CAE) exam. The course begins in July and ends with the exam in Torquay in August. The minium level for this course is B2. The 5 week Cambridge summer course prepares for FCE and CAE only. The Cambridge courses do not include the exam fee (depending on the level). The one-to-one course includes 15 lessons per week of 60 minutes each. The main aim of this course is to help you to understand and to communicate in English within the shortest time possible. Particular attention is paid to listening, speaking and pronunciation. Clients needing preparation for special projects, tasks or presentations find this course particularly useful and you will be able to work on a project or prepare an English Language presentation with your teacher. Would you like to take an English course abroad with your whole family? The Family course in Torquay is the right choice for you then! With the Family course for parents, you will receive 15 lessons of English per week from Monday to Friday from 09:00 to 12:20. Your children will attend an English course in groups with students the same age at the same time. So you can concentrate fully on the course while your children playfully learn English as well. The afternoons you can spend together. With the Family course for juniors, your kids will receive 15 lessons of English per week from Monday to Friday from 09:00 to 12:20 while you will attend an English course in groups with students the same age at the same time. This way you can concentrate fully on the course while your children playfully learn English as well. The afternoons you can spend together. The Family course for juniors aged 6-15 years old with activities offers 15 lessons of English lessons per week from Monday to Friday from 09:00 to 12:20, and various afternoon activities organized by the language school. The English lessons take place at the same time as the English course in which the parents will participate. This program also includes lunch for the kids after the English lessons. Afterwards, students will participate in the activities from 14:00 until 17:00. Staying in a homestay is an ideal way to make the most of your stay in Torquay. It represents good value for money, gives you the opportunity to experience the English way of life, culture and food. All homestay accommodation includes a single bedroom, a study table or separate room to study in, breakfast, evening dinner, a light lunch at weekends and light laundry. The homes are within walking distance of the school and there is a good bus service to the town centre where the school is located. No other student of the same nationality will be booked into the host family at the same time. Hosts always meet students on arrival at the bus or railway station if notified of arrival time. An executive host family includes a single bedroom, private bathroom, a study table or separate room to study in, breakfast, evening dinner, a light lunch at weekends and light laundry. The homes are within walking distance of the school and there is a good bus service to the town centre where the school is located. The Club TIS Study Room is open each evening for quiet study. There is a guest computer so you can check your email or use the internet or do your homework. Wireless internet is free throughout the hotel. A buffet breakfast is served every morning at the residence restaurant and in the evening a Guests' Kitchen with simple cooking facilities and a fridge for students who wish to prepare a simple supper. The Club TIS Café is open every lunchtime from Monday to Friday with a choice of home cooked hot and cold meals. A south-facing terrace leads out from the dining room and on a sunny evening it’s a perfect place to sit and enjoy the view across the English Riviera. Club TIS is only a few minutes walk to a variety of pubs, cafés and restaurants in the town centre. The school has apartments about 5 minutes walk from the school. Here you can stay in a single or double room and share the apartment with 4-5 other international students. A double room can only be booked by two students traveling together. Bed linen and towels are provided. The apartment has a fully equipped kitchen and you have access to Wi-Fi.